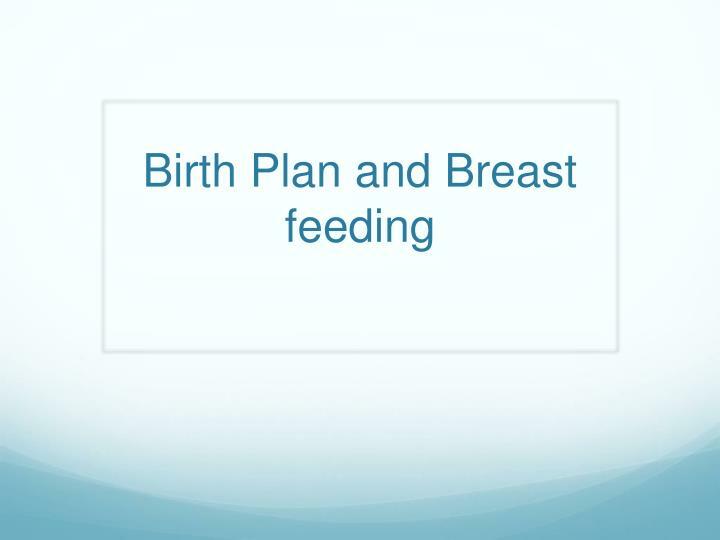 Birth Plan and Breast feeding. 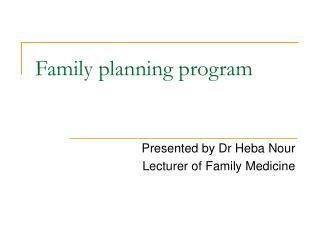 Birth Plan. 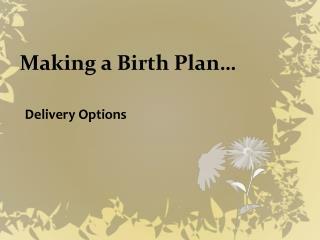 A birth plan is a way of communicating with the midwives, doctors, and nurses who care for you in labour . It tells them about the kind of labour you would like to have, what you want to happen and what you would like to avoid, if possible. 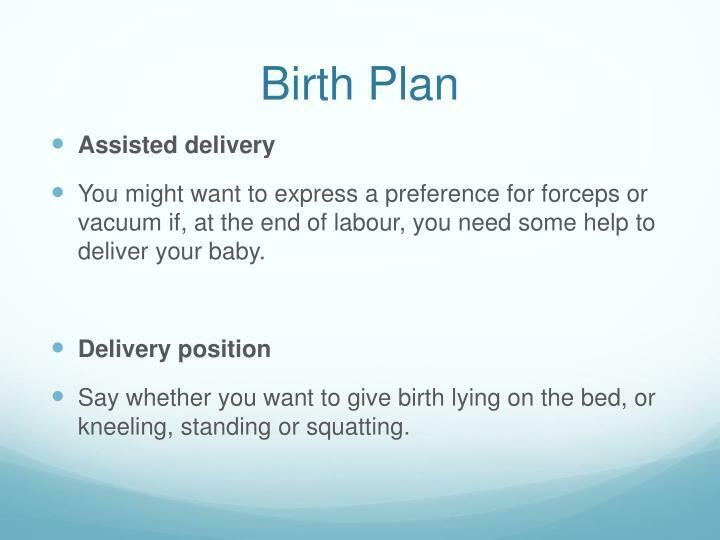 A birth plan is a way of communicating with the midwives, doctors, and nurses who care for you in labour. It tells them about the kind of labour you would like to have, what you want to happen and what you would like to avoid, if possible. 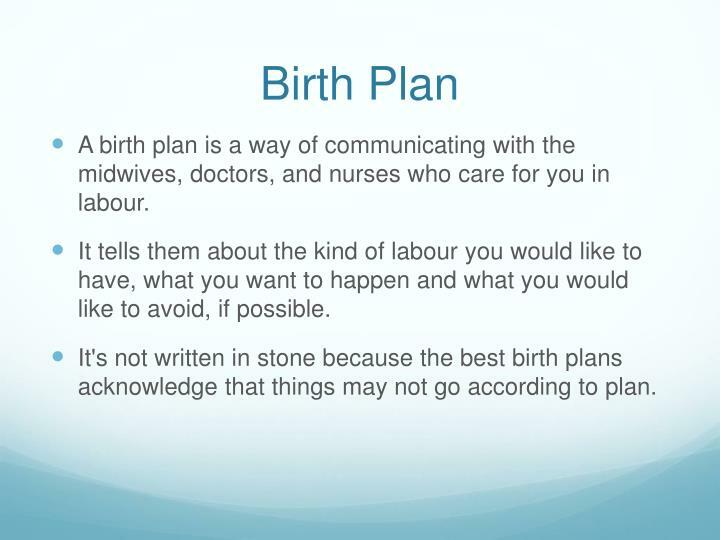 It's not written in stone because the best birth plans acknowledge that things may not go according to plan. 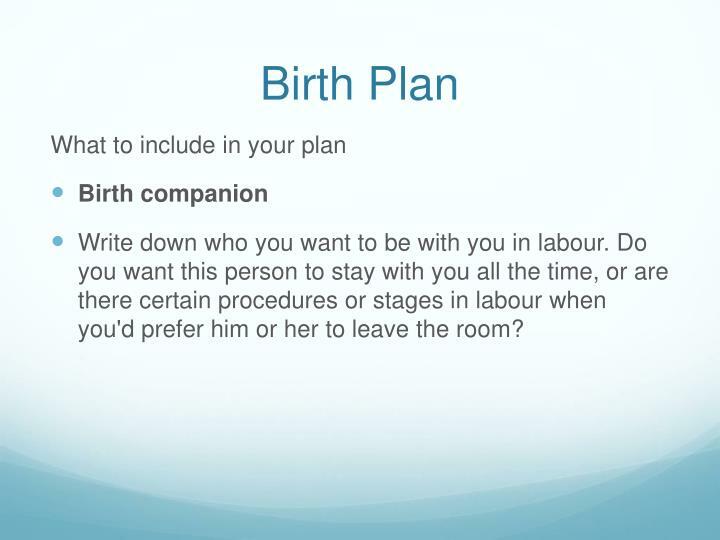 Write down who you want to be with you in labour. Do you want this person to stay with you all the time, or are there certain procedures or stages in labour when you'd prefer him or her to leave the room? 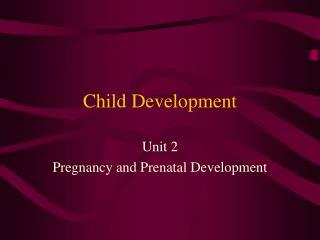 Mention which positions you would like to use during labour and for your baby's delivery. Also say how active you would like to be: would you like to remain upright and mobile for as long as possible, for example, or would you prefer to be in bed. 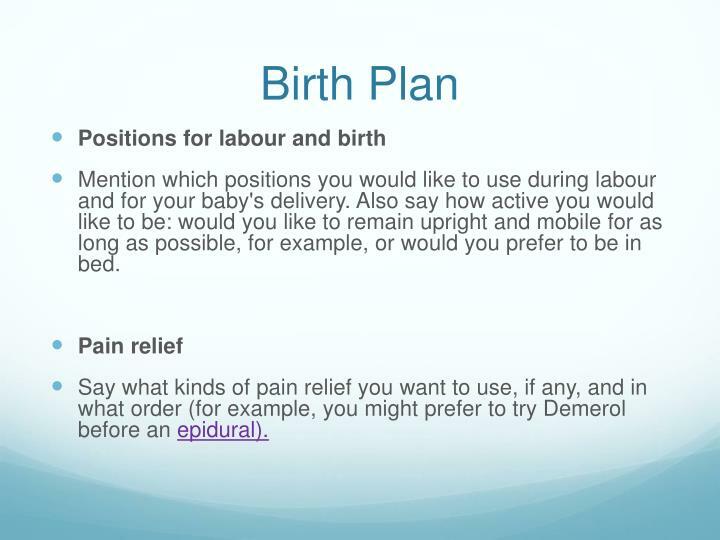 Say what kinds of pain relief you want to use, if any, and in what order (for example, you might prefer to try Demerol before an epidural). 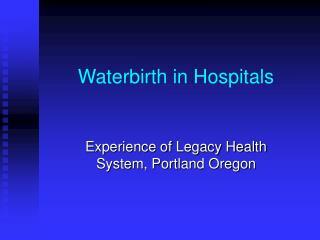 If your hospital has a birthing pool, or if you are renting one to use at home, write down whether you want to use it for pain relief and/or to give birth in. 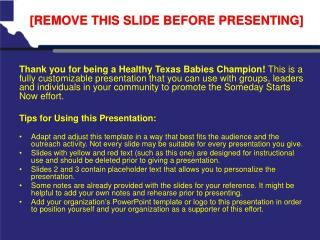 Say how you want your baby to be monitored during labour. 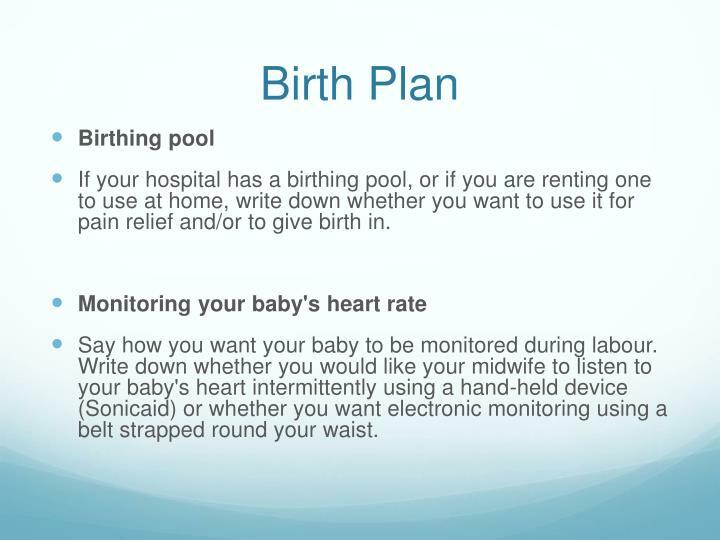 Write down whether you would like your midwife to listen to your baby's heart intermittently using a hand-held device (Sonicaid) or whether you want electronic monitoring using a belt strapped round your waist. 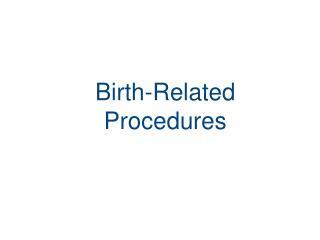 You might want to express a preference for forceps or vacuum if, at the end of labour, you need some help to deliver your baby. 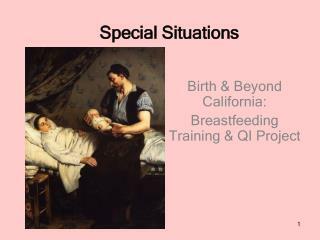 Say whether you want to give birth lying on the bed, or kneeling, standing or squatting. 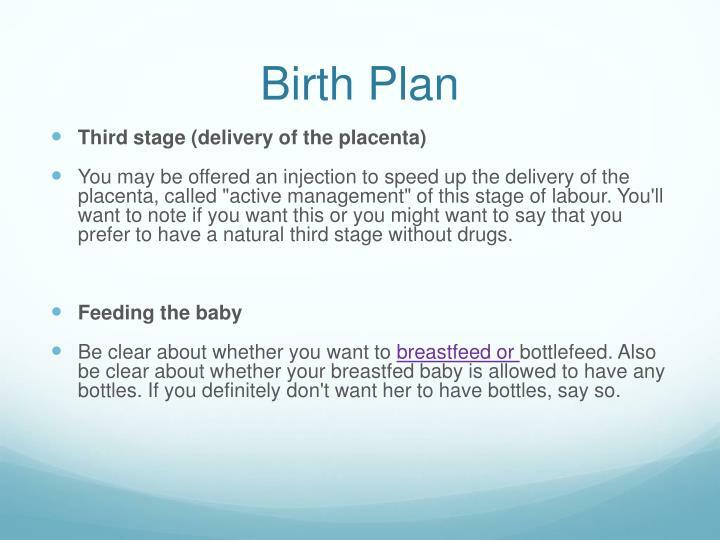 You may be offered an injection to speed up the delivery of the placenta, called "active management" of this stage of labour. 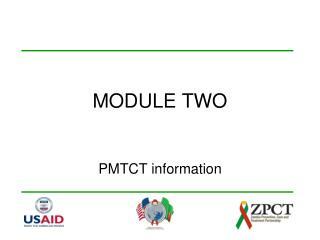 You'll want to note if you want this or you might want to say that you prefer to have a natural third stage without drugs. 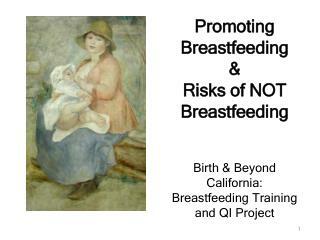 Be clear about whether you want to breastfeed or bottlefeed. 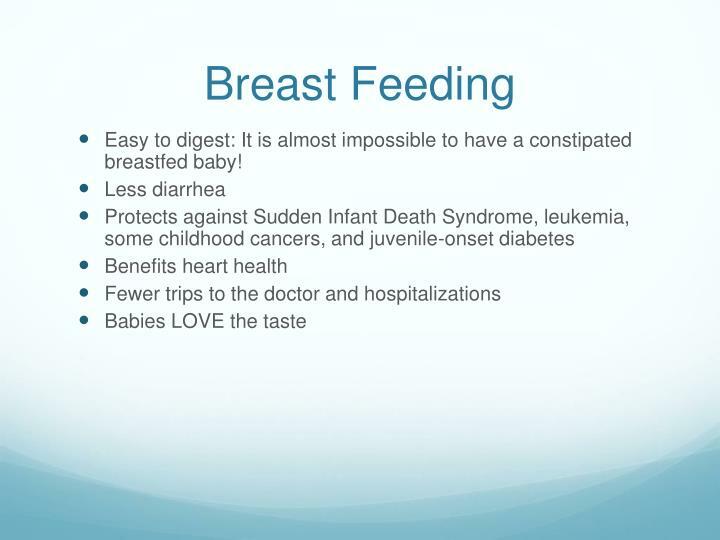 Also be clear about whether your breastfed baby is allowed to have any bottles. If you definitely don't want her to have bottles, say so. 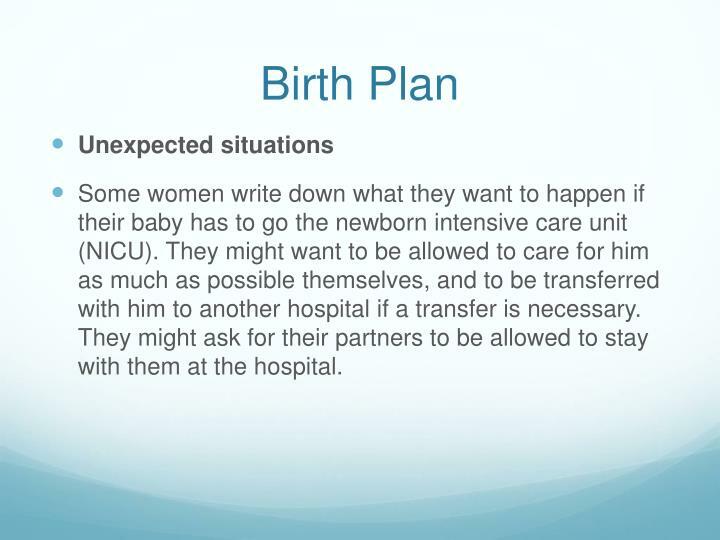 Some women write down what they want to happen if their baby has to go the newborn intensive care unit (NICU). 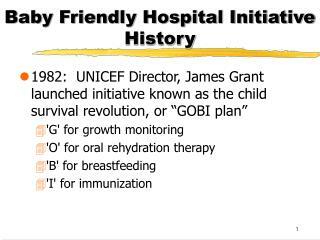 They might want to be allowed to care for him as much as possible themselves, and to be transferred with him to another hospital if a transfer is necessary. They might ask for their partners to be allowed to stay with them at the hospital. 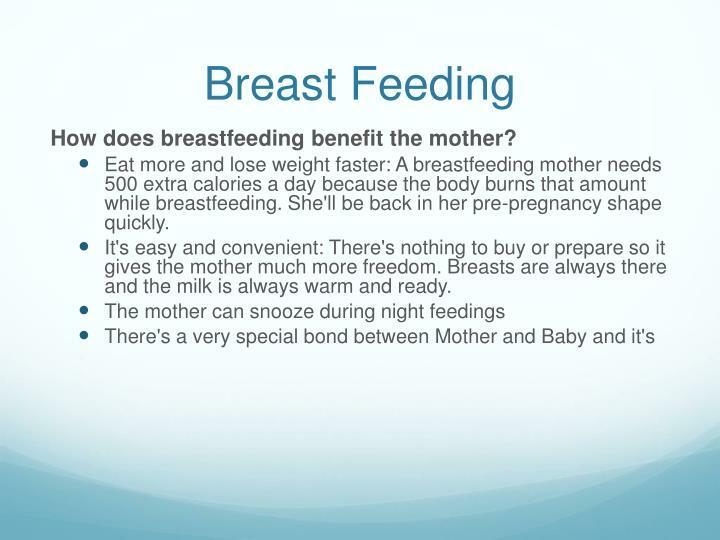 Eat more and lose weight faster: A breastfeeding mother needs 500 extra calories a day because the body burns that amount while breastfeeding. 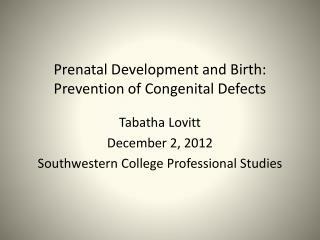 She'll be back in her pre-pregnancy shape quickly. 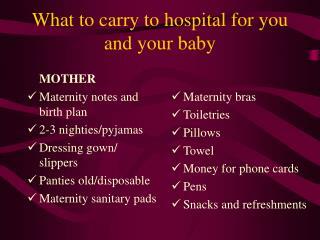 It's easy and convenient: There's nothing to buy or prepare so it gives the mother much more freedom. 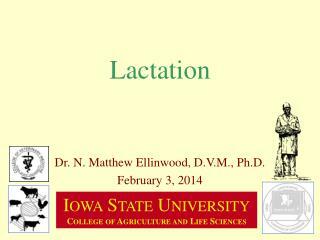 Breasts are always there and the milk is always warm and ready. 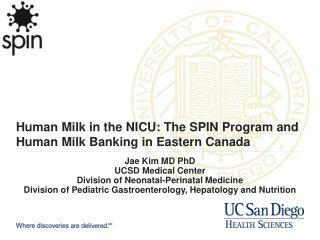 There's less spitting up, no stains and the poop doesn't smell! 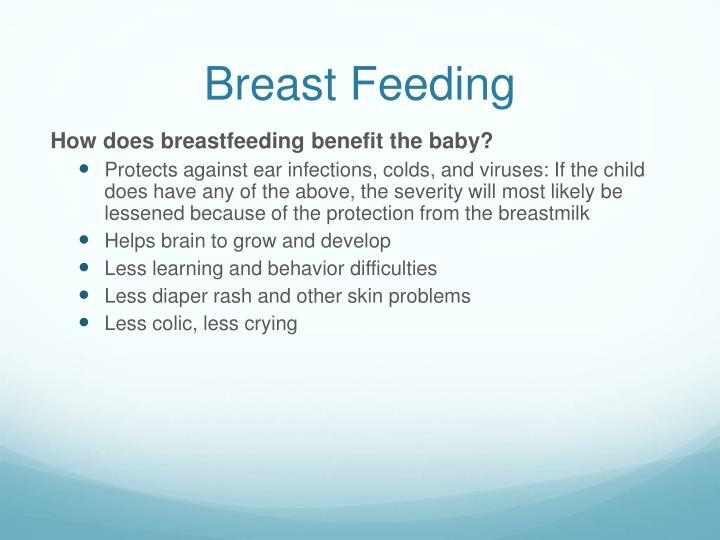 How does breastfeeding benefit the baby? 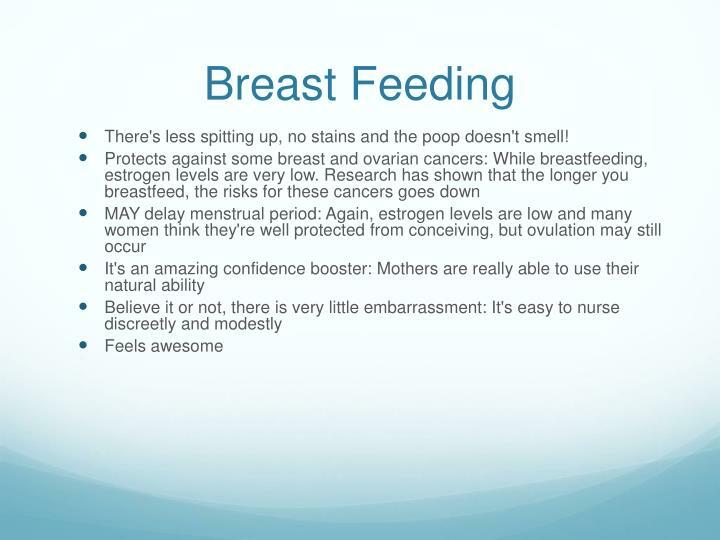 Easy to digest: It is almost impossible to have a constipated breastfed baby! 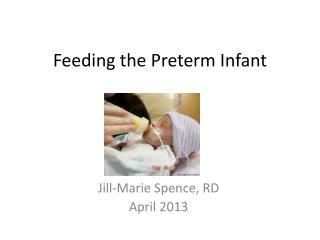 nursing is definitely time-consuming: Newborn babies typically feed every 2 to 3 hours during the day and may awaken frequently at night. 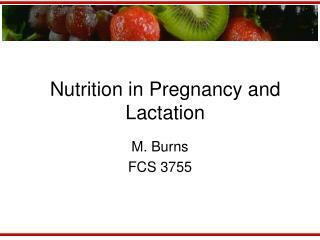 If someone else wants to feed the baby with a bottle of breast milk the mother still has to pump. 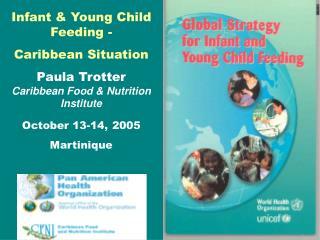 Breastfeeding takes a lot of energy for your body to make milk, so the mother can often feel quite fatigued. 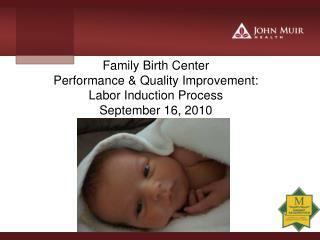 There can be a certain amount of anxiety and frustration while a mother is learning the process. 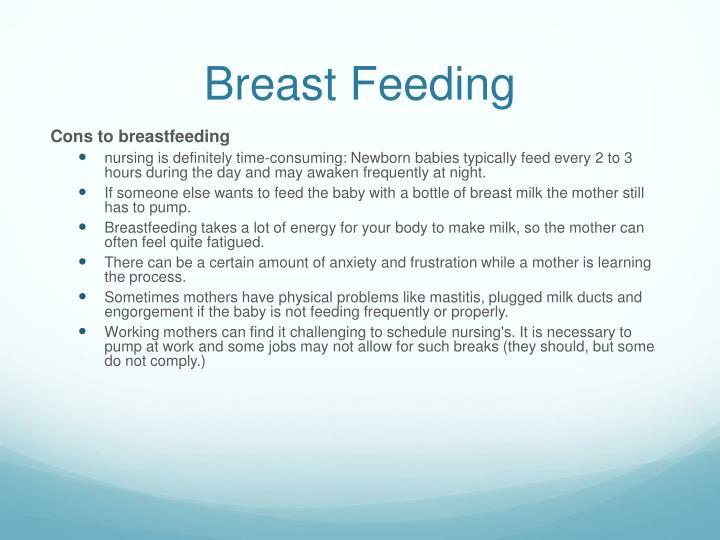 Sometimes mothers have physical problems like mastitis, plugged milk ducts and engorgement if the baby is not feeding frequently or properly.